Supplied as original equipment to the Ford Motor Company for the 300bhp Ford Focus RS and all the fastest hot hatches around the nurburgring. The Quaife ATB Helical LSD differential for the new Ford Focus RS Mk3 4x4 is a direct replacement for the standard Ford open differential. Backed with the peace of mind of a lifetime warranty, the Quaife ATB helical gear limited slip differential is fully automatic and progressive in operation and unlike plate style units the Quaife ATB never locks, but seamlessly and smooth transfers power and torque away from a spinning wheel to the wheel enjoying the most traction. The Pumaspeed Workshop team are ready to fit the Quaife Differential for the New Focus RS Mk3 Ecoboost in our Head Office located here. We estimate the labour time to be approximately 8.00 hour(s) costing £624.00 inc VAT. Therefore making parts and labour a total cost £1,361.99 (inc. VAT). 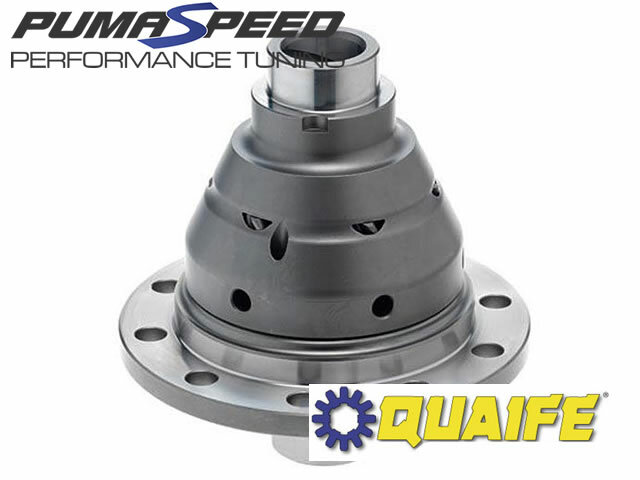 Pumaspeed have a specialist distribution team that can dispatch the Quaife Differential for the New Focus RS Mk3 Ecoboost to any destination worldwide.